El-Sherbini El-Said, E., El-Sayed, G., Tantawy, E. (2010). Effect of Camel Milk on Oxidative Stresses in Experimentally Induced Diabetic Rabbits. 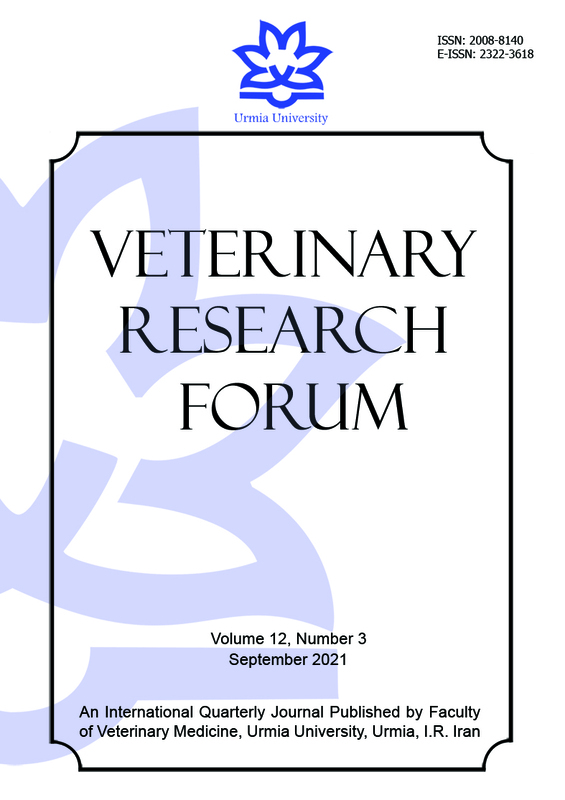 Veterinary Research Forum, 1(1), 30-43. El-Said El-Sherbini El-Said; Gehad Ramadan El-Sayed; Esraa Tantawy. "Effect of Camel Milk on Oxidative Stresses in Experimentally Induced Diabetic Rabbits". Veterinary Research Forum, 1, 1, 2010, 30-43. El-Sherbini El-Said, E., El-Sayed, G., Tantawy, E. (2010). 'Effect of Camel Milk on Oxidative Stresses in Experimentally Induced Diabetic Rabbits', Veterinary Research Forum, 1(1), pp. 30-43. El-Sherbini El-Said, E., El-Sayed, G., Tantawy, E. Effect of Camel Milk on Oxidative Stresses in Experimentally Induced Diabetic Rabbits. Veterinary Research Forum, 2010; 1(1): 30-43. Camel milk has an importance in the treatment of diabetes. It has been shown that the patients who drink camel milk daily, their need to insulin decrease. Therefore, this study aimed to investigate the effect of camel milk in comparison with insulin treatment in experimentally-induced diabetes. This study was carried out on forty male New Zealand rabbits, divided into four groups with ten rabbits in each. The first group G1 was considered as control non-diabetic group and received only normal saline solution. The other animals were injected intravenously with alloxan for induction of diabetes mellitus and then divided into three groups' ten rabbits each as the follows: G2 considered as control diabetic and left untreated, G3 was considered as diabetic and treated with insulin, and G4 was considered as diabetic and received camel milk. At the end of the experiment (4 weeks), blood (whole blood & serum) and tissue samples (liver, kidney and pancreas) were collected from all the animals for analysis of: enzymatic SOD and catalase, non-enzymatic GSH antioxidant enzyme activities. Serum malondialdeyde, glucose, insulin and lipid profile also were analyzed. The results showed that the camel milk was effective in the treatment of diabetes in comparison to insulin treatment alone. In addition to its hypoglycemic effect, camel milk improved the diabetes-induced oxidative stress. The histopathological evaluations demonstrated that there was a regeneration in β cells and the islets of Langerhans among the pancreatic acini in rabbits receiving camel milk. Our findings suggested that the camel milk administration in case of insulin dependant diabetes mellitus might be recommended as an oral anti-diabetic remedy.